Loaders fit for every task. 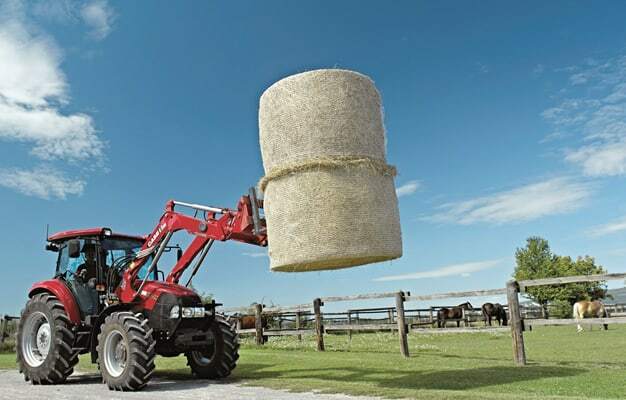 The Farmall JX series features a factory fitted loader with bucket as an option, offering many time – and labour – saving advantages, perfect for livestock applications. COMFORT COMES STANDARD. A new ergonomically designed cab or a no-nonsense ROPS platform configuration are available to suit your list of chores. INCREASED POWER. The Farmall JX range features a range topping 110 hp model offering an entirely new level of power and performance. LOADERS FIT FOR EVERY TASK. The Farmall JX series features a factory fitted loader with bucket as an option, offering many time – and labor – saving advantages, perfect for livestock applications. MULTI TASKING FLEXIBILITY WITH NEW POWERSHUTTLE TRANSMISSION. The new shuttle option is perfect for loader work in livestock applications, offering smooth direction changes and increased productivity.